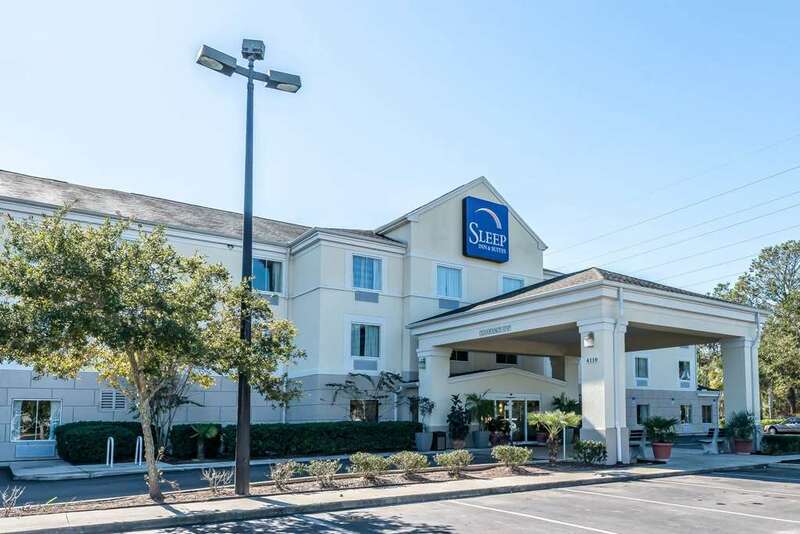 The Sleep Inn and Suites University/Shands hotel near Oaks Mall in Gainesville, FL will give you simply a stylish experience. This smoke-free hotel is near destinations like Ben Hill Griffin Stadium, Kanapaha Botanical Gardens, Stephen C. OConnel Center and City College-Gainesville. Our property offers a free courtesy shuttle from 8am-5pm daily. Shuttle runs up to 5 miles from hotel. Please call hotel for specific shuttle stops. Enjoy amenities like free breakfast, free WiFi, fitness center and outdoor pool. Guest rooms include a flat-screen TV, refrigerator, microwave, coffee maker and hair dryer. Also, earn rewards including free nights and gift cards with our Choice Privileges Rewards program. This hotel is 100-percent non-smoking and pet-free. A 200.00 USD cleaning fee will be incurred if you smoke or bring a pet in your room. All guarantee cards are pre-authorized 1-2 days prior to arrival for one night's room and tax.